It’s Spring time and the famous Aristocob Cobfoolery contest is open for entries. 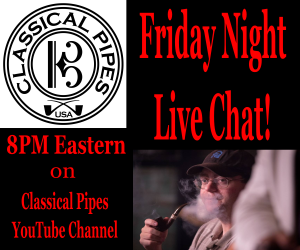 This contest has become one of the major events in the pipe smoking hobby. There are some guidelines you need to follow to enter. Getting into the right class, etc., so the best thing to do is watch the Aristocob video and make sure you understand the rules. The biggest rule is that the pipe you make must be made of Genuine Missouri Meerschaum Corn Cob. That is the combustion chamber we are talking about. The Sky’s the limit on modifications after that. It hasn’t been updated as this story goes to press, but the Cobfoolery.blogspot website is another good source of information. Be sure to check in there throughout the contest. There are three different Classes. Amateur Class. Open to people who DO NOT make money in any form selling pipes. Pro Class. You know who you are. You work in any form making pipes of any kind. Homegrown Cobfoolery Class. This is for people who have purchased and grown corn with seeds from Missouri Meerschaum. In each of the first two Classes there are both Freehand and Classic categories. You may enter up to two entries, and they can both be in the same category, which is a new rule for 2019. The Grand Prize winner in each Class will receive a $50 Gift card to Aristocob.com where you can get the most amazing Corncob pipes and Corncob pipe accessories. Plus the coveted Winner’s Plaque. In the Amateur Class there is a Blue Ribbon panel that will choose the winners. In the Pro Class everyone is welcome to cast a ballot. Details will come as the contest progresses. One of the rules, to ensure that the pipe you make is actually “smokeable” you must post of video of the pipe being smoked on YouTube. The video must be available to the public. To keep interest going, as in years past, each week one name will be drawn from among those who have already entered. The prizes vary, but the sooner you enter, the more drawings you are entered in. Here is the kickoff video. We will try to keep this updated throughout the contest. Good luck to everyone who enters. Dunhill Shell 5105 ESTATE Pipe Made In 1985. 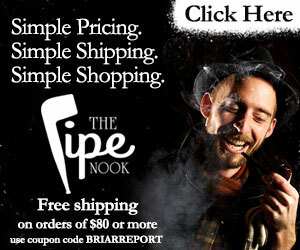 The Briar Report (www.briarreport.com) was founded in 2016 to be the premier source of pipe & cigar smoking news and information. In the time since we have lived up to that description. In 2018, because of space, too many cigar stories were being passed over so we decided to spin-off the Stogie Report (www.stogiereport.com). Stogie Report is aimed exclusively at the premium cigar smoker. Also in 2018 we began publication of our online magazine. The magazine is a place where we , as well as our readers, can publish articles and reviews that are of interest to pipe smokers. We also highlight what's happening in the YouTube Pipe Community (YTPC). Our Events calendar is a fantastic resource to keep you informed with everything in the pipe smoking community. Our content features the latest news and most up-to-date information you're going to find anywhere else. 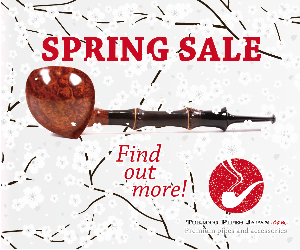 Our staff consists of pipe and cigar smokers with well over a century of experience, combined. Phil and Bill edit the Briar Report and the Stogie Report, respectively. We also have a media specialist who owns one of the most successful audio gear and podcasting consulting services. We have a webmaster and finally the lowly intern, Felix. The magazine is a collaborative effort of the entire staff. Copyright © 2019 Briar Report Magazine. All rights reserved.